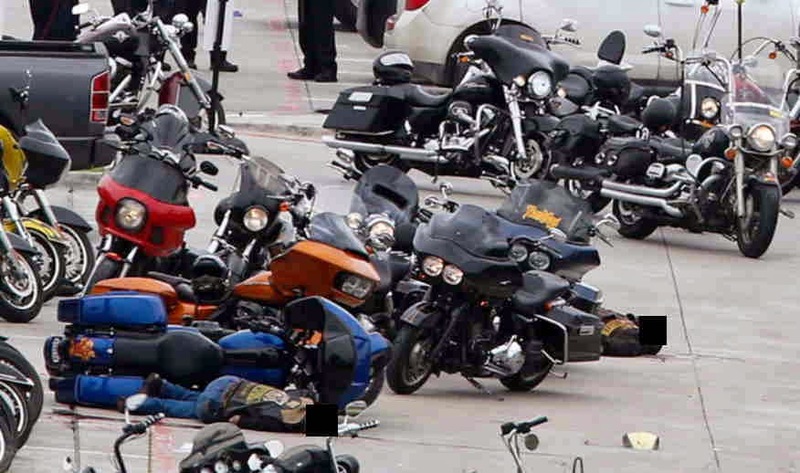 Deadliest motorcycle “gang” in Waco shoot-out was not Bikers. It was police. Was the Waco Shoot-out a gunfight between rival gangs or an ambush laid by law enforcement? Police are monopolizing the testimony but the evidence suggests a barroom brawl became a pretext to kill or arrest club officers, essentially grassroots organizers, now charged with “organized crime”. Investigators can litter the crime scene with brass-knuckles, knives and wallet chains, but the shell casings are going to be police issue. Motorcycle headlights were on, indicating club members were trying to leave. Police claim that the brawlers redirected their fire toward officers, but did that happen while the bikers were trying to ride off? Because riding requires both hands. This gangland “shoot-out” was a St Valentine’s Day Massacre executed by cops. It’s described as being a gang shoot-out, but what happened in Waco is still shrouded in the fog of the official POV. Did motorcycle club members shoot at each other? They’re unavailable for interviews, locked up on million dollar bonds. The Twin Peaks restaurant claims the shooting started outside. The only witnesses reaching reporters are the sergeant giving the press briefing and undercover cops purporting to describe the tensions between the “gangs”. By my reading, informant provocateurs incited trouble by “rocking” patches which claimed the territory of “Texas” for the Cossacks Motorcycle Club. Something like three dozen undercover officers were monitoring the usually uneventful bi-monthly meeting of the Confederation of Clubs and Independents, in anticipation that the “Texas” patch would offend the Bandidos MC. They were able to respond within 45 seconds of the alleged altercation. What might have been an unremarkable barroom brawl, if even that was not contrived, turned into an ambush that killed nine and wounded eighteen. Zero officers were hit and I will bet every bullet was theirs. Let’s say the melee happened as the police and media describe. Why the blackout on the club affiliations? Why are the 170 arrestees being detained on a million dollar bond each? Why aren’t reporters challenging the police narrative? Witnesses assert that at least four of the dead were killed by police. How long before we learn how many undercover officers had fired their guns? The media is making much of the anticipation that fellow gang members are converging on Texas to avenge their comrades. I think the police know that it’s themselves who are the targets of the bikers’ vengeance. No doubt one can say the bikers were not boy scouts, but have you seen the photos? These “gangs” wore their colors, in this case patches, like boy scout badges. And everyone in uniform creased jeans and leather vests as tidy as bowling shirts. Did you see the mugshots? If you look past the long hair and tattoos you’ll note everyone is clean shaven. This was a Sunday outing. These are family men and women, not gang members. The Cossacks are a “Harleys Only” motorcycle club for God’s sake! Police aren’t naming the “gangs” involved in what’s being called the “Waco Shoot-out”. Because they are motorcycle clubs, for one, and because the only gang deserving of the notoriety is really the police.